Heaven by Deborah Mitchell is one of my favourite skincare brands but I have to admit to being less familiar with the bodycare products from the celebrity facialist's range. 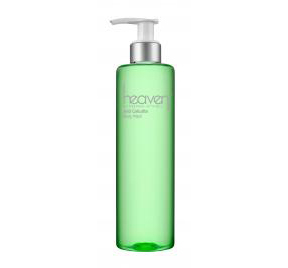 With this in mind, I was intrigued to try Heaven by Deborah Mitchell Anti-Cellulite Body Wash.
On first impressions, I liked the slimline bottle which features a functional pump dispenser. I also appreciated that the bottle is transparent so that I could tell how much was remaining. The body wash itself is a bright green colour and has a very liquid formula which doesn't lather very much (it bubbles ever so slightly). Some may find that this takes away from the indulgence factor but I was pleased to note that there's no harsh SLS included which dries out my skin. The only downside is that I felt as though I was going through the bottle quite quickly- this tends to be the case with most body washes but I felt that it was enhanced given the formula. It has a strong botanical fragrance which I found to be awakening in the mornings. The oil-rich formula meant that my skin wasn't left feeling tight & dry after use, although I still needed to moisturise as there was no oily residue left on my skin. I tend to be quite cynical when it comes to products which profess to have anti-cellulite properties and this is no exception. I certainly can't claim to have conducted a scientific experiment or even anything as simplistic as taking a photo of my problem areas before and after use (for fear of breaking my camera!). However, the ingredients list is impressive including vitamin A & C rich asparagus, white birch to help break down calcified deposits and eucalyptus and cypress to increase metabolic rate so it certainly can't have done any harm to incorporate this into my routine. At £26.20 for 250ml, this is a worthwhile product to pick up if you have some spare pennies but if you're looking for an introduction to the brand, I'd be more inclined to go for the famous skincare range. Nice post. Laser hair removal treatment is suitable very popular .You have shared nice tips which must be known by people who are interested in this treatment .Thanks for sharing. cellulite in Houston. Nice review and here you are thinking a really great to fit our body. Please keep us up to date like this. Thank you for sharing….ANTI CELLULITE Wenn die tatsächliche als einen Bikini tragen macht dir Angst als Folge der verzogenen Haut an den Oberschenkeln, Hintern und Oberarme, vielleicht können Sie noch einmal. Ihre Ära der Sorgen sind fertig die Ankunft des Anti-Cellulite-Behandlung.